Railpictures.ca - Bill Thomson Photo: Another view of a detouring CN train (pictured before here) on CP at Smiths Falls, pulling ahead and showing off the trailing Conrail C40-8W units 748, 752 and 747 behind CN 5335. The three blue units were part of 60 C40-8W units purchased by Conrail for leasing service with LMS (GE), with many on a shared lease between CR and CN. Unlike some of the units painted blue but lettered LMS, these later units were numbered and painted in the CR livery. When the Conrail split happened, the leasers were divided up between CN, CSX, and NS. | Railpictures.ca – Canadian Railway Photography – photographie ferroviaire Canadienne. Caption: Another view of a detouring CN train (pictured before here) on CP at Smiths Falls, pulling ahead and showing off the trailing Conrail C40-8W units 748, 752 and 747 behind CN 5335. 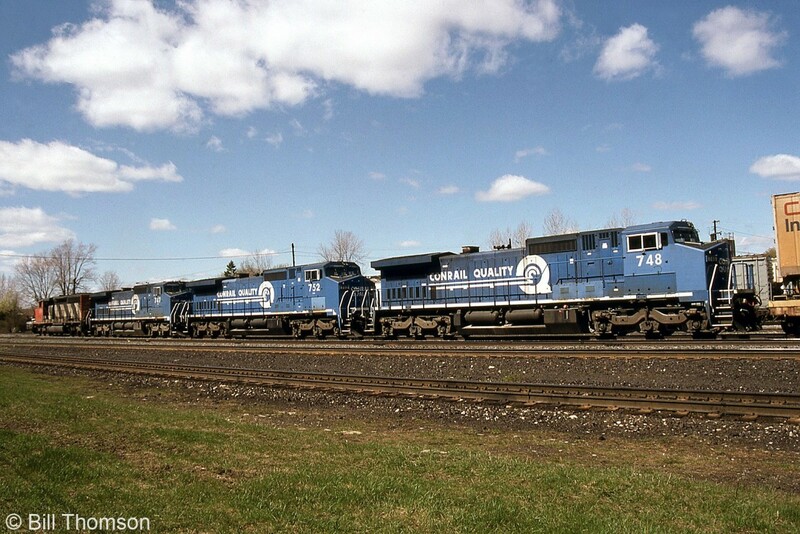 The three blue units were part of 60 C40-8W units purchased by Conrail for leasing service with LMS (GE), with many on a shared lease between CR and CN. Unlike some of the units painted blue but lettered LMS, these later units were numbered and painted in the CR livery. When the Conrail split happened, the leasers were divided up between CN, CSX, and NS. Nice! It never occured to me that these were part of the LMS fleet. According to to the Conrail cyclopedia webpage 700-739 wore LMS lettering with 740-759 wearing the Conrail markings. These units could almost be considered Dash9′s since they were built with some features like split cooling and electronic fuel injection that were not applied to the majority of Dash8′s.